As everything has to end, this year’s KDD-IBAK Kuwait Badminton League concluded with the best team holding up the championship trophy crushing five other endowed teams. And it’s none other than the “Super Smashers”. The final witnessed their incommensurable talents over the opponent team “The Sabres”. It was indeed a battle of nerves between both the teams where at the end Super smashers reaped the trophy with a 3-0 lead. KBL is the premier and only professional badminton league in Kuwait. 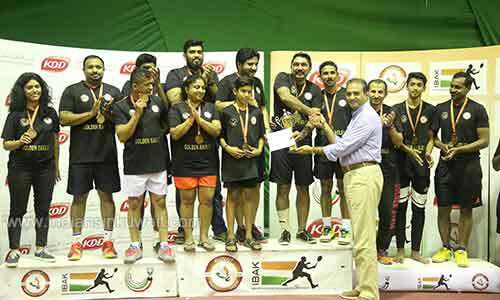 Indian Badminton Association Kuwait (IBAK) in association with Kuwait Badminton federation (KBF) had conceived the idea of a league in 2015, and this was the 4th consecutive year in which the league was held. 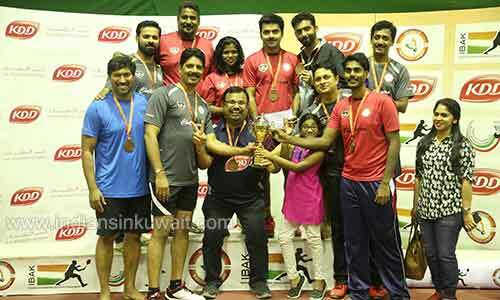 Kuwait Danish Diary (KDD) was the title sponsor of Kuwait Badminton League for all these years. The 2018 KDD KBL prize distribution was done by Mr. V.V Subramanian VP -Business Integration KDD, in the presence of Dr Manimara Chozhan Chairman IBAK and Hon. Chairperson KBL, Mr. Chandrahas K.T, General Secretary IBAK and President KBL, Ajaykumar Vasudevan, VP, KBL and Mr. Bipin Madhavan, COO, KBL as well as other directors of KBL. 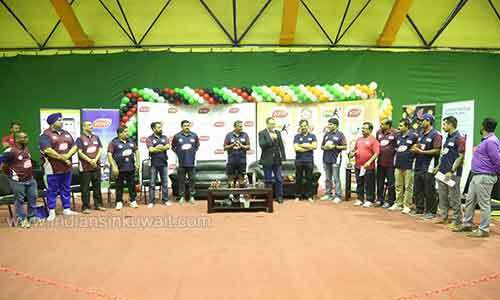 While inaugurating Mr. Subramanian stressed the need for healthy living which is in tune with the vision of KDD and reiterated the commitment of KDD on supporting badminton in Kuwait. KDD –Kuwait Badminton League 2018 had six teams owned by IBAK members which were sponsored by individuals/Corporates and participated in the 2018 edition. Top 102 players who practice across different clubs in Kuwait were auctioned into each team during the first week of September 2018. 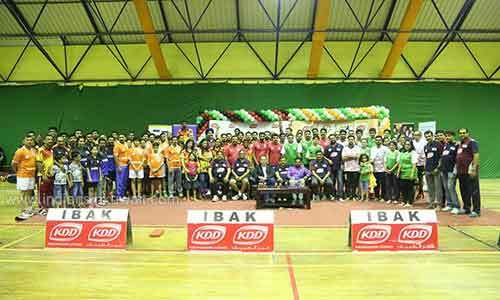 KDD–KBL was a fantastic opportunity for players where senior/international players helped and played with junior players and the experiences and expertise were shared across. The 2018 league consisted of 6 teams, SUPER SMASHERS, SABRES, GOLDEN EAGLES, CHALLENGERS, WHITE FEATHERS & THANJAI NINJAS and was played in a round robin/ Knockout format. Each tie had 5 matches, 1Singles, two open doubles, one advance doubles and a mixed doubles. Four teams out of six teams advanced into the knockout stage. In the finals, Super Smashers and The Sabres had their most gifted players in their arsenal. Singles were played with Sarvesh Raj Kumar from Super smashers and Chris Sijo from The Sabres and Sarvesh won by (21-5,21-14). 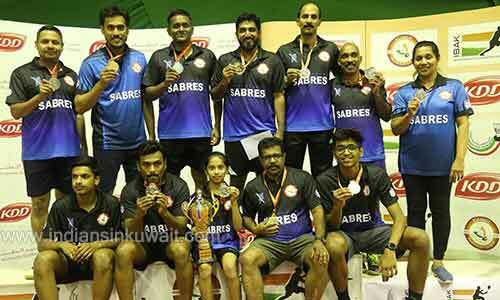 In Open Professional category, it was their captain Aneef K Latheef and Bastain James who beat Bader and Don Francis by (14-21,21-19,21-13). This match became the highlight of the finals and it was always neck to neck between the two teams. 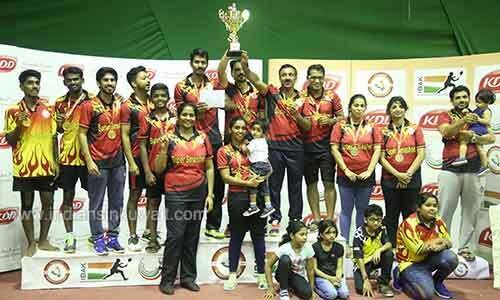 In the Advanced category, Suresh Kumar and Relin Thomas trashed Mohd Minhaj and Joby Mathew by (21-11,21-14). Semi Finals had Golden Eagles and Challengers in this battle of titans. But they couldn’t make it to the finals. The Golden Eagles falling to the Super Smashers and the Challengers to The Sabres respectively. Kuwait Badminton League 2018 title sponsor – Kuwait Danish Diary (KDD) – In line with its vision of “Wholesome Goodness” KDD came forward to support IBAK for the fourth consecutive year. Super Smashers – Indian Lebanese General Trading Co, Archilum Illuminating Lives, Unique computer System Est.